Character and convenience: 100 Proof. Once a fixture in a Tennessee distillery, now an extraordinary furniture piece for your home. 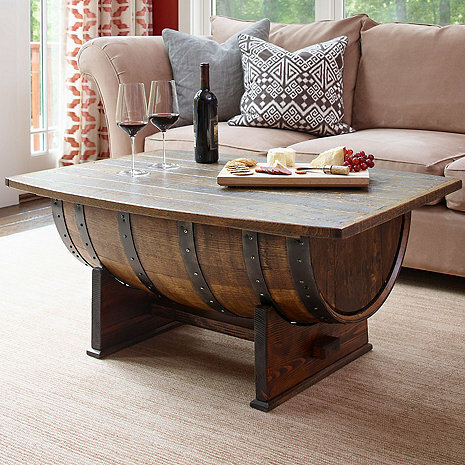 This re-purposed aged-oak Whiskey barrel features a spacious tabletop, hinged to reveal a generous storage area. Includes original barrel, oak tabletop and base hand-stained for rustic charm. Each piece is handmade and hand-finished. Every piece is one of a kind! Actual color and markings will vary, adding character to your space. In your video you show a gas strut in your specs it states a brass hinge. I would like the shock. How do I know that I will receive the one with the strut? The color of the wood is amazing! In one picture, it looks to have a walnut stain, and in the one with the tabletop open, it appears to have a lighter finish. What kind of finish is shown? BEST ANSWER: It is the same exact table in the pictures. It is just the lighting in the room. You can see the same chair in the picture behind it. If there is a lot of light in the roomit will look lighter. Can we pick it up to save on the shipping cost? BEST ANSWER: You can't pick it up to avoid the delivery charges because it come from Japan. Ours arrived and even said on the box Japan. Kind of false advertising making you think its made in the USA since its advertised as a TN whiskey barrel. Unfortunately, you cannot pick this up. I dont see an option to choose between lighter or darker stain. So where is that option?? BEST ANSWER: Don't think that's an option- mine is a little lighter in color than the magazine- maybe more walnut than say mahogany. I bought mine 6 weeks ago for our wine room and it looks perfect in there. Ours is a darker stain and I don't think I would like it as much if it were in a lighter stain. Anyone that sees my table comment how nice it looks and asked where I got it. I do not believe you can select that option or the details listed might be incorrect in that you have the ability to select a color-my table when arrived from a stain/color standpoint looks exactly like what is shown in the picture. Not too fussy light or dark. Ido have oak so probably light will be ok. There is no option. It actually is light and dark stain so it should go with anything. I love mine. Thank you for your question, the Vintage Oak Barrel Table is only available in the stain shown. I'm not aware of any options when you order this, very nice table. NO option for stain color. Its almosy a darl walnut color. does it come in a slightly bigger size? I purchased this table last month. I had wished it came bigger as well but I decided to order it anyways. We absolutely love it! It stands out very well in our great room and also smells very good too, like your at a vineyard :) it is hand made so it took a little bit to receive it. When you order make sure they provide a lift gate to get off the truck as the shipping company doesn't do it for you. I'm not sure if there is any size variety but it's very nice. Looks great in our living room. I would double check directly with Wine Enthusiast. Hi Bill...we just received our table and love it but I don't think it comes any bigger. It is beautiful though and a conversation piece for sure. I Do not believe so. It is a nice size coffee table we love it. I cannot answer that question, because I don't know! It was only advertised one size. There is only one size. Hello. Is the inside of the barrel charred? If so, does it smell of smoke or is it sealed with polyurethane so it doesn't? BEST ANSWER: I think all whiskey barrels are charred. this one has been sanded so there is no loss charcoal black. It has been stained, but is very dark. No smell of charcoal as the booze took care of that. no polyurethane either. it is a used bourbon barrel and is not charred, you can store things inside of it, our grand kids keep small pillows inside of it. Hope this helps. Very nice table, larger than we thought. The inside was charred but it has been clear coated so nothing rubs off. We keep blankets and pillows in there with no problems. Yes the inside is intact charred, it doesn't smell of smoke, it's not sealed. The inside has been sanded and cleaned. Nothing needed to be done. No smell -clean and ready to use. is the base stand attached to the barrel? Or is it just placed in there and if the table is leaned on it can shift around? BEST ANSWER: it's really solid no wiggle room on ours appears to be one piece have had it awhile so really cant remember it being brought downstairs- hope this helps! I was sent an email to answer this question but I'm sorry I cannot answer this question as I have not yet received my table. the base is a separate piece, but since the table is heavy, there is no movement. Very sturdy construction. The lid is attached to the base so it does not shift around. The table is very good quality. They are constructed separately and attached to one another so one piece when received. The base is attached to the barrel and is very solid. It is attached however it wobbles. What color stain are the tables? BEST ANSWER: The stain is in the dark walnut family. i recall there was a choice of light (like picture), or dark stain. I chose the darker one as it matched my furniture. Kind of like a dark walnut. I would call mine a dark walnut. Color will probably vary depending on the individual barrel. Very dark not what l expected No variationts in color or pigment. Can you please tell me what the color is on this ? Ours was like a dark oak but not as dark as cherry. Ours needed to be replaced, still waiting for it. Hopefully it will be the same shade. Can this wine barrel coffee table stay outside all year round without getting mold, either in East or West coast? BEST ANSWER: No. This is an indoor piece of furniture. this is an indoor piece of furniture. It has a nice finish, so it should last for at least some time outside. I do not think you want it in the rain. There are skids on the bottom. You can see in the picture. If they rot out, they should be easily replaced. It is definetly indoor furniture. It might be ok under a covered area but it could not take rain, heavy sun or harsh weather. Thank you for your question, this Whiskey Barrel Table is made for indoor use only. Do you buy used wine corks? Wine Enthusiast does not buy used corks. No I don't. We have tons ! Hi, I'm interested only in the base/stand. I have the half barrel already and need to have it sit on a sturdy stand. Are you able to sell only the stand? Thank you. BEST ANSWER: The Handmade Vintage Oak Whiskey Oak Coffee Table is sold as one piece. We are unable to provide you with just the stand. Can you use these on a covered porch? BEST ANSWER: The Handmade Vintage Oak Whiskey Barrel Coffee Table is not recommended for outside use. A covered porch can protect it from some of the elements but not all of them. I would say yes as long as it does not get wet a lot. BEST ANSWER: The Handmade Vintage Oak Whiskey Barrel Coffee Table is about 20 inches high, each piece is unique and the height might vary very slightly. It has a generous storage area and is a beautiful piece. I thought this table was made in USA? I received my table and the box says made in Japan. Where is the table made, and where are the barrels from? BEST ANSWER: These tables are 100% made in the US from reclaimed Whiskey barrels that come from American distilleries. We will look into the box issue of it stating made in Japan, but rest assured this is a US product. Thank you so much for your comment! where is the Oak whiskey Barrel coffee table made? How durable is it? BEST ANSWER: If this was made in the USA then why does the box say it came from japan? This item is made in the USA and it is very durable. A strong piece. Is there a place to buy the replacement "legs"/"feet" one of the corners got messed up on mine? BEST ANSWER: We do not sell replacement parts for the Handmade Vintage Oak Whiskey Barrel Coffee Table. I can only suggest you contact a carpenter and they should be able to help you. how do I add a picture to my review? BEST ANSWER: Unfortunately, at this time, there is not a way to upload images on a review. Where are you located? How much would shipping be to Buffalo New York? Do you shop to the UK? BEST ANSWER: We can ship to the UK. Please select International Shipping within the checkout tab. This will bring you to our 3rd party site which will calculate all the shipping, duties and taxes for you. What is the weight capacity for this table? I could see a guest at some point sitting on the table to visit when no where else to sit. BEST ANSWER: The weight limit is approximately 150 lbs. however it is not recommended for seating. Is it possible to get a smaller size top? If so what would the minimum size be? BEST ANSWER: Unfortunately, only one top is available for this table. Cannot make requests unfortunately but all are authentic whiskey barrels. Do you ship to United Kingdom ? Is there any difference between a wine barrel and a whisky barrel? Is there any markings on the barrel that indicate is was a whisky barrel? BEST ANSWER: Yes there is a difference in the coloring between the two. The wine barrels usually show a burgundy color while the whiskey is darker. Also the markings are random so we cannot guarantee there will be markings on the whiskey barrel table. What if you get it and it's damaged? We purchased this coffee table for our den. It definately gets the most attention from guests than any other furniture pieces in the house. The craftsmanship is excellent and looks much better in person.We highly recommend! !! I purchased this at first sight . I always second guess myself after ordering from a photo but not this time. It is fantastic and I swear you can still smell the whiskey. Very well made and high end . I'm not sure why there is a few negative remarks on here but that is not my experience. Blown away and love,love, love it !!! Coffee table in entertainment area. Even still smells of whiskey! Wonderful addition to living room ! ! ! This wine barrel coffee table adds to the warmth with glass in hand by fire roaring in living room ! ! ! We absolutely love the coffee table it arrived in a timely manner and was well protected for delivery. It's beautiful. Was definitely worth it. Disappointed in product as it looks like it was hastily assembled. Not very sturdy and the top doesn't match the barrel like in the picture. Some of the screws were not tight and the top is flimsy when it is lifted up. Wood for the table top looks new compared to the aged look of the barrel. Finish on the table top was also rushed and not consitentent. Love this piece of furniture!! It is very well made!! It was shipped really well too!! I like the style as it is very unusual. However, the color is nothing like what is pictured. The picture is a beautiful rich looking color and the actual item is definitely not. I like the table "okay" - but definitely not in love with it like I was with the picture. We really love the table. We were not prepared that the barrel would be much darker than the table top. My Barrel Table is very unique. I have never seen one like it. Everyone comments on it when they see it. The finish is gorgeous. The craftsmanship is great. It just looks fabulous with all my leather furniture & Sante Fe style. The storage it provides is a big plus also. I am extremely pleased with this purchase. I love this table! Came exactly as promised. I have had many compliments on it. VERY HAPPY WITH OUR PURCHASE!!! We ordered another coffee table for our summer home and must say we love as much as the first. I love the quality of this item and highly recommend it . We love our new whiskey barrel coffee table! It complements our other furniture and is an eye-catcher when guests arrive! The color is perfect and quality is excellent! Now we are trying to decide which end tables would match and complete our newly changed living room style. I would recommend the Oak Whiskey barrel coffe table to anyone looking for a masculine look, I have it in a bar/sports area. The table is very well built, finished with a walnut stain, and has roomy storage under the table top. Dave in Denver. It's beautiful and just exactly what we wanted!.. Put in on our screened in patio.. Love it! Perfect for entertaining! I would have given this 5 out of 5 stars in regards to just the actual furniture product itself. It is absolutely stunning and extremely well-made. It looks as described in is a beautiful piece for anyone's living room or den. My only issue was with the delivery. It is delivered on a huge palette and the trucker is not allowed to take the palette with them. So I'm stuck with this huge palette to cut up and try and get in the trash. I absolutely love the table in the photo the distressing, the color of the stained wood. The overall quality is excellent. The table I received however is not. The stain is no where close to even and the base is a different color. There are very large gaps where the barrel and the base meet. The actual barrel used doesn't have near the character as the one in the photos online. The shipping and delivery were nice. I would suggest lowering your expectations if you order this, which is hard given the price tag. I like the table very much. But the shipment was not so nice. The shipping company left a big loading planks for us to dispose it. I am living in the city, I have to wait two months for city to pick up such large object. Absolutely love this beautiful piece of furniture. Very natural and fits our decor in the Man Cave. Would definitely recommend to anyone who wants a unique coffee table. A plus is that you can also use to keep items in. Thanks for a beautiful work of art. I have a wine room and this is the center piece for this room. I have had many people tell me they love it. Shipping was way longer than advertised. Almost 8 weeks to the door when 2-4 weeks was promised. Overall the table is beautiful and seems to be well crafted. We had one screw that driven in at an angle and left a hole but it isn't readily noticeable. I received my coffee table today. It came way sooner than the expected delivery which made me very happy. It looks absolutely beautiful and finishes my living room tying it all together and bringing a cozy and warm feel to it. Grossly over priced. I one made from a free French oak wine barrel from Napa wineries. The furniture maker made two tables for $300.00.